TPC Overall Rank: #14 out of 2933 rides. One of the most beautiful carousels ever made, in wonderful condition and with 3 Working band organs,(The Frati organ playing the most) you can also try to catch the brass ring on this wonderful, carousel but that's not all it's very fast! Absolutely wonderful ride! Very well-maintained and looks gorgeous. To me this ride embodies the spirit of Knoebels. The ride has great history, is fun, moves well, and has a long cycle. The brass ring game is really wonderful and a lot of fun; it really adds to the throwback factor of this ride and to its ability to be enjoyed by people of all ages who might otherwise not enjoy carousels. The wonderful band organs add even more to the ride...there is great variety amongst the three of them, and they all sound great because they are taken care of so well. It is clear that Knoebels really cares about the experience of this ride. A whole family can enjoy this fabulous ride more than once. I relly can't rate this beacuse this is really not condsier a thrill ride . Beacuse its goes really slow. Excellent carousel and easily one of the best out there. The entire carousel is a true beauty as all of the wood-carved horses are in excellent condition and it still has a classic band organ as well. Best of all was the rare opportunity to try and catch the brass ring. 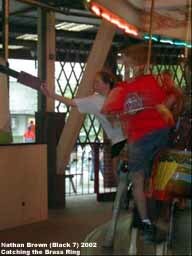 Knoebels gave a long cycle as well. After 17 years of going to Knoebels, this carousel is as beautiful as ever. One of my favorites. The organs are a special sentiment. Dave Wynn, the curator and maintainer of all of Knoebels organs,is a dear friend. He cares about the instruments and it shows in their asthetic and musical beauty. My 15 year career as an organ builder and organist came to be, thanks to Knoebels. Heartfelt hugs to this park, always! Fantastic! A candidate for my favorate carousel. I love the multiple band organs and the brass ring machine. Beautiful carousel. Its pretty lame if you arent on an outside horse, because the fun is in getting the brass rings. Any carousel that still has the rings and is well kept is going to get a ten from me. Its that simple. to try to get the ring though. Grabbing a ring is the way carousels should be!